>It’s quite a time of year. You wouldn’t think of November as a great blooming time, but with the cooler weather just barely grazing us this time of year, all the fall bloomers spring to life. 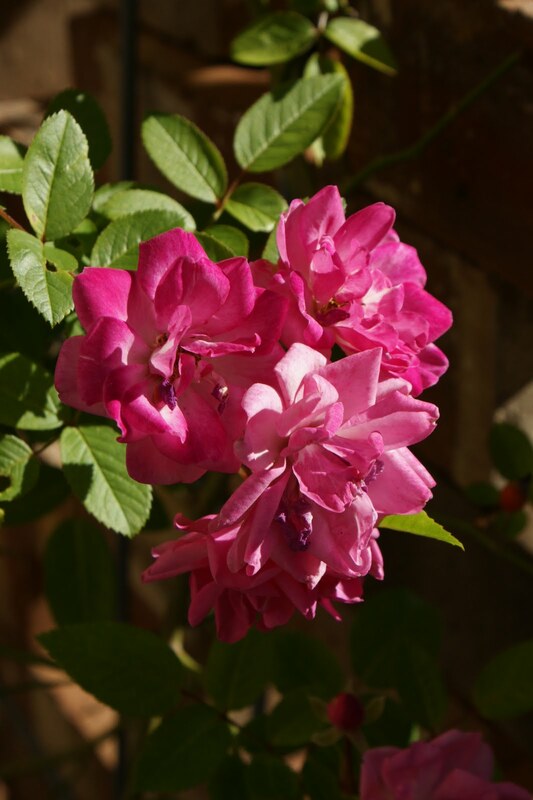 Glad to share it with you for Garden Bloggers Bloom Day, hosted by May Dreams Gardens. 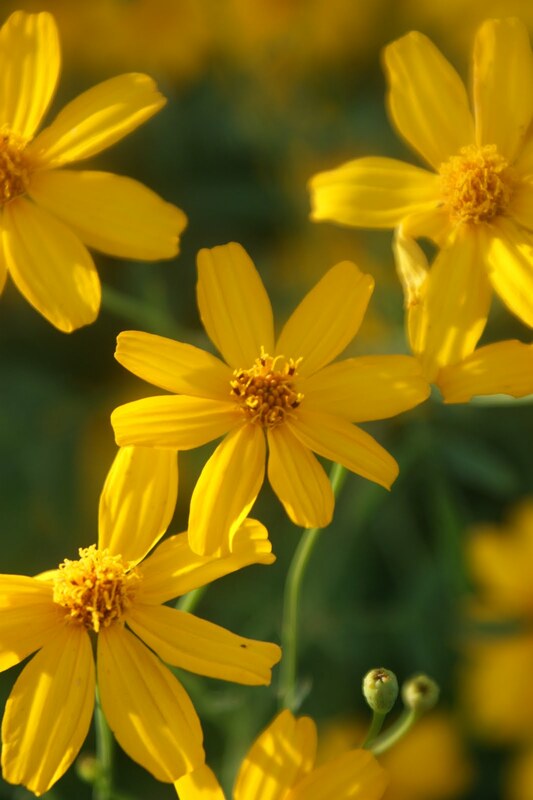 Primary in both my garden and neighborhood right now is Copper Canyon Daisy, an amazing show of yellow flowers that just spring out of nowhere. I am only sad that they do not bloom all summer as well. 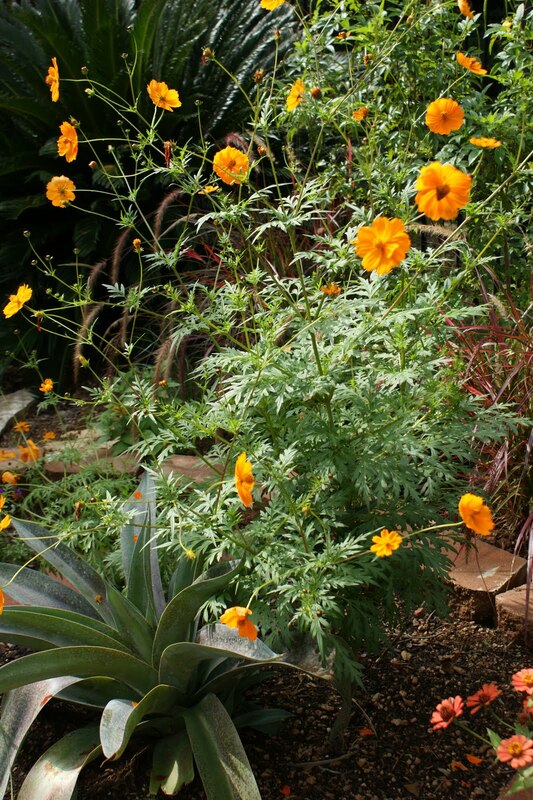 Every year, this plant gets cut back to the ground and grows back with it’s airy foliage. But I have to wait awhile to enjoy the blooms. 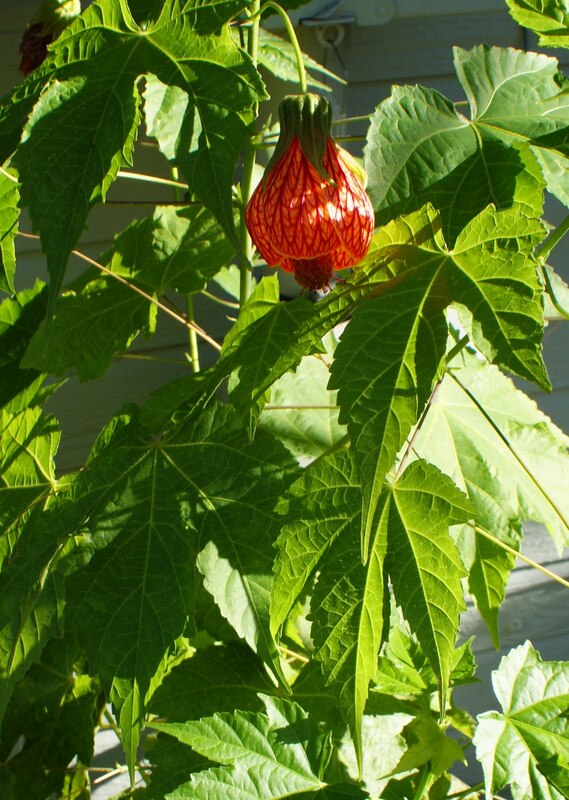 The new Abutilon plant I added this year now has little blooms all over it, hanging like ornaments on a Christmas tree. I hope that it will bush out next year for me even more. I seem to have a variety of purples battling it out in my garden this time of year. 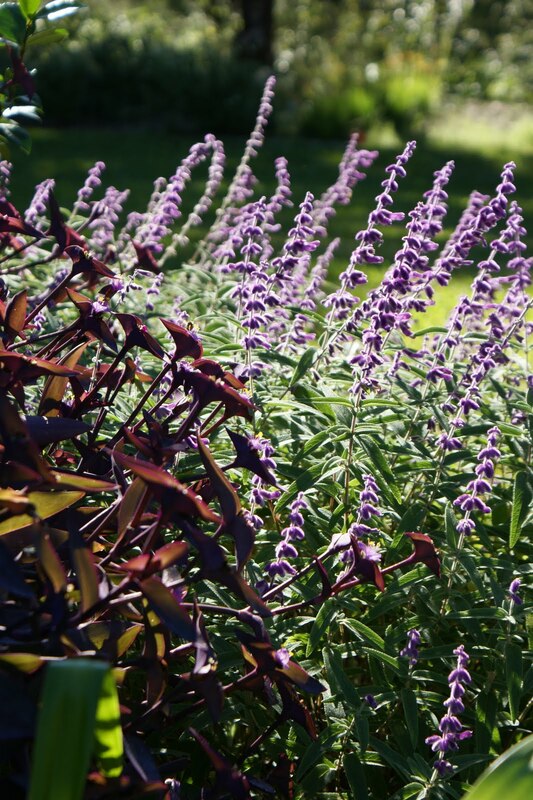 In one bed, Mexican Bush Sage, blooming since mid-summer, is showing off next to Purple Heart, another long-term bloomer. Both extremely drought tolerant. And Mexican Bush Sage is extremely deer resistant so tends to get used behind and in front of the fence. 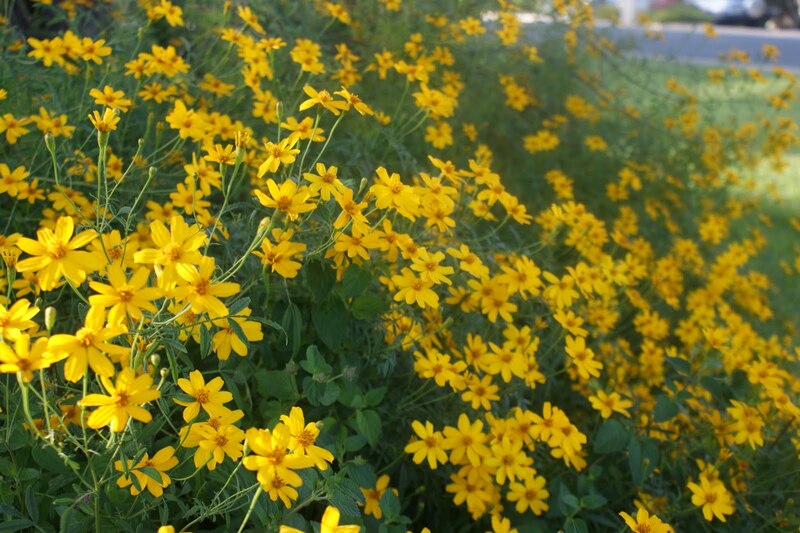 But I did have a few Mexican Bush Sages that suffered with our EXTREME drought this summer. I just cut them back and voila! they sprang back and started blooming again, with less foliage to support in the drought, they have really put on a fall show. 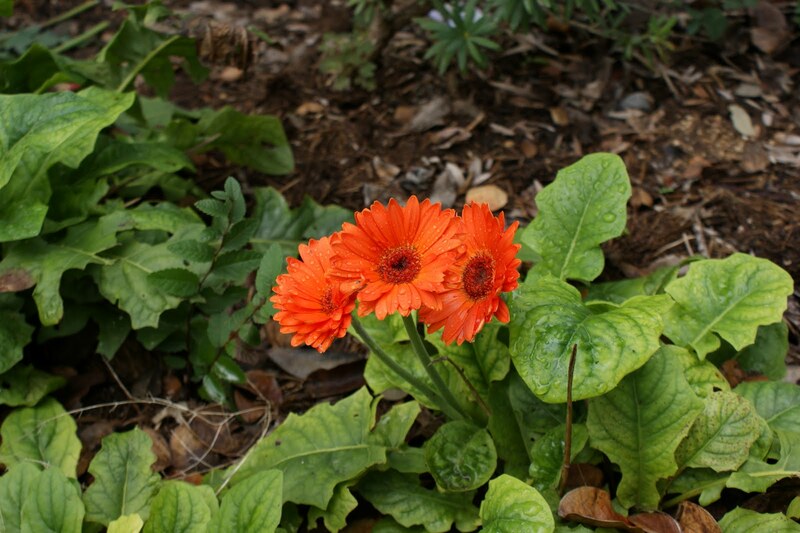 I have three gerbera that I planted 3 years ago. The red one blooms repeatedly but I only get a rare showing from the yellow and orange. But lo and behold, the orange has really come out this fall, so I can’t help but feature it here. My “Macho Mocha” mangave has finally found a good location in the reorganized full sun bed. I gave it a slightly raised location with better drainage. And in one of my seed madness binges, I dropped some seeds in the ground around the back of it. Little did I know that 5 foot tall cosmos would spring up. But I love the color and they are the Starbucks of the bee world right now, with bees coming and going all day. Finally, I can’t ignore the workhorse of my summer garden, the zinnias that reseed themselves every year and bring me a variety of colors. 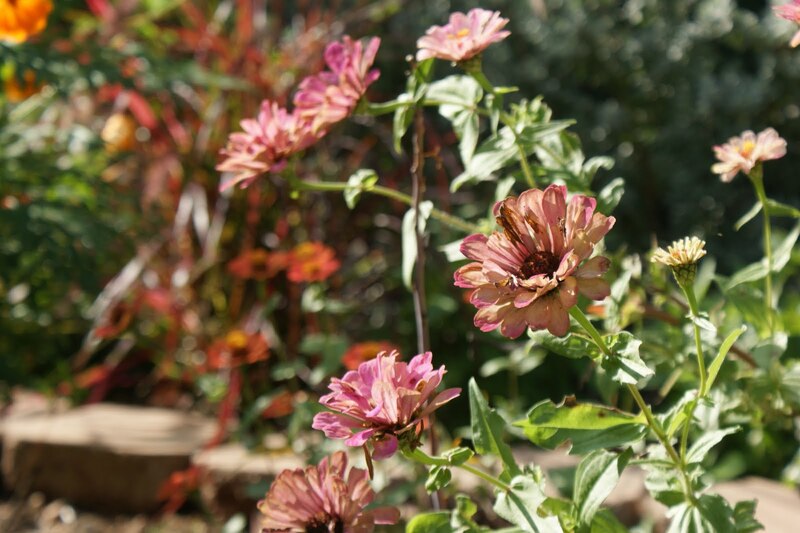 No matter what heat or drought, the zinnias just keep on coming. God bless them. Every climate needs a flower like that. Here are a few pinks to end my post that seem to be reaching the end of their season, but beautiful nonetheless. > This weekend my cousin Howard got married to Maggie. It was a very personal ceremony held at the house of a friend in an old section of Austin. While enjoying the view off the deck after the ceremony, my aunt and I noticed some amazing, gigantic acorns in the tree on the other side of the driveway. And when I say gigantic, I mean it. Check out the pictures with my hand in for size. That is MY hand, not my kids. 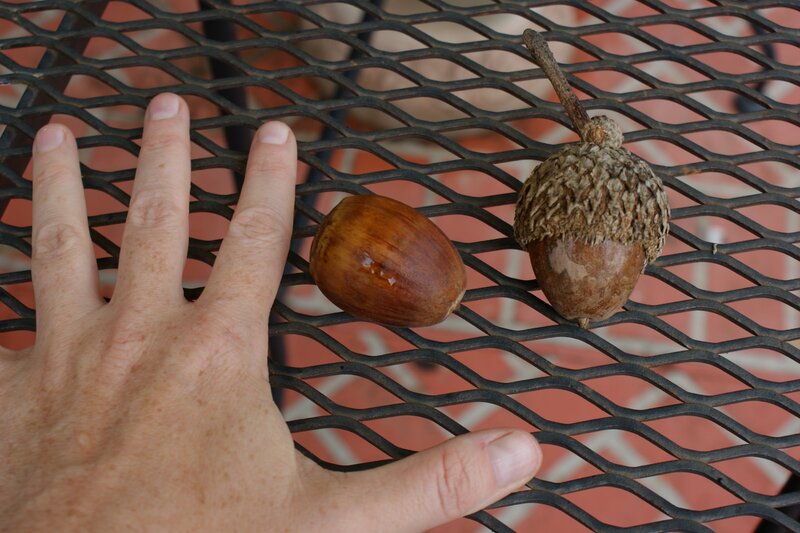 My uncle inquired and found out it was a bur oak, named for the fringy top around the acorn. So being the classy family that we are, my aunt, uncle and I immediately traipsed around the side of the house in our wedding attire and collected about 8 acrorns each. I thought the kids would think they were very cool for show and tell items. 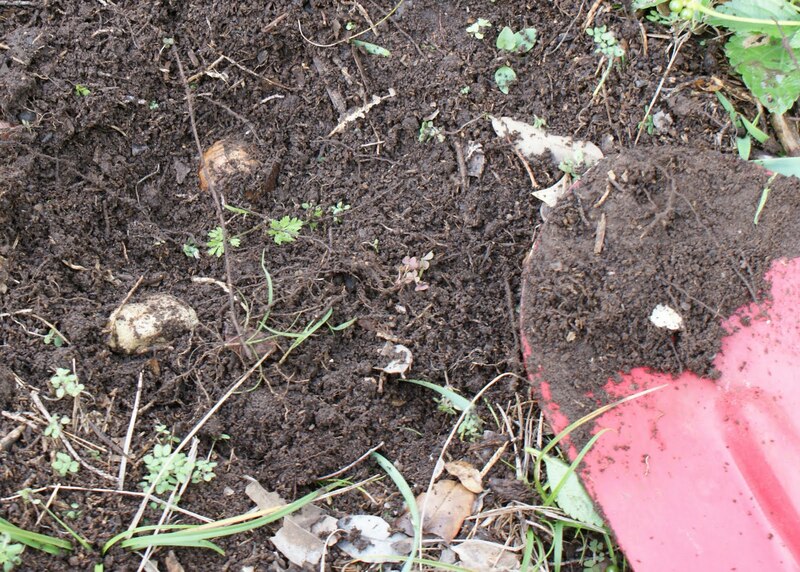 But today I was thinking about replacing a cedar tree that we lost on the corner of our property and it came to me that I already had a tree ready to plant…my bur oak acorns. So I took two outside and planted them, one where the cedar was lost and another in the wooded area alongside our driveway. Should I be so lucky that these little acorns will sprout, I will have a lovely memory of the occasion that led to their gathering and how a tree’s growth is such an overwhelmingly perfect analogy for the growth of a marriage. >Can I grow to love pink? >OK, let’s start with a fact about me. I’m not a pink kind of girl. Never have been. Always preferred more earthy colors like olive green and brown. Pink was just too outspoken for me. The palest of pinks was something I could tolerate, but never the bubblegum or hot pink. But it’s hard to avoid pinks in your garden. They have snuck in over the years and surprise me. At first, I wrinkled my nose at them, but now I am intrigued. Some start hot and stay hot. Others fade to a paler shade by bloom’s end. I’m not a meticulous gardener. If I have a packet of seeds for too long, I’ll just have a seed spreading day and spread them all over the garden. That’s how my hot pink zinnias came to be. 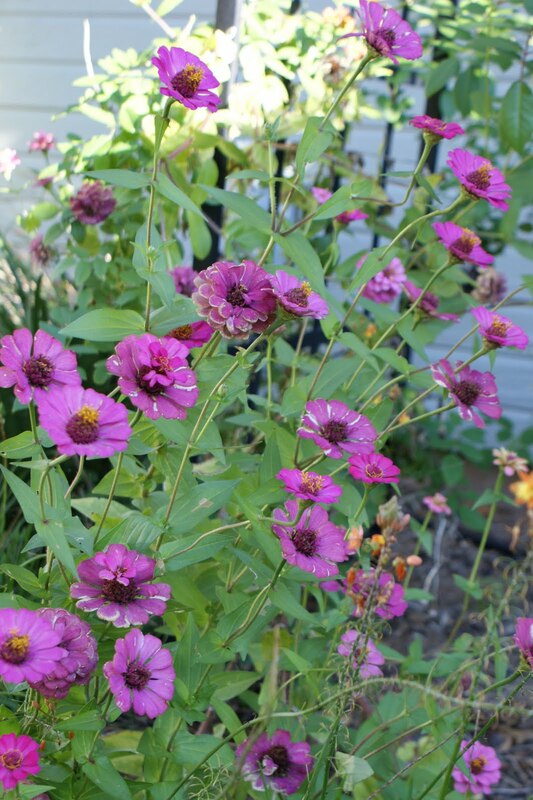 They are like a little gaggle of sorority girls, all reaching to be the tallest, shouting, “look at me, look at me.” Zinnias are easy to propagate from seed and will often reseed the next year. My kind of flower, even if they are pink. And then there is my Peggy Martin rose. My dad and I each bought one after reading her incredible survival story through Hurricane Katrina and subsequent rediscovery and propagation as a fund raiser for the Gulf Coast. She’s a climber. My dad’s is now stretching across his entire arbor. Mine is on a trellis that creates a screen for our air conditioning units. It develops clusters of hot pink blooms in April through May. It repeats its blooming in late summer/fall and mine has just started, perhaps a late response due to the drought. But it will bloom until frost robs it of the pink gems. Very disease resistant and low maintenance. So while I may not be a pink girl, I have come to love these pinks in my garden that brighten their surroundings, scream to be noticed, survive the inferno that is our Texas summer, and leave me with a smile.